There’s no possible commentary on that. It speaks for itself. Military barbarism is now seen as liberation to many who call themselves progressives because they oppose US intervention. That’s why the international antiwar movement is so weak & fragmented is an epoch of endless murderous wars. The international antiwar movement must be rebuilt with a principled program opposing military intervention by any of the present regimes. Max Blumenthal was on The Real News defending his scurrilous attack on White Helmet rescue workers in Syria. As detestable as his hack-job is, the more audience he has for his accusations, the more we have to answer him. None of his work is original; a fair amount of it is outright plagiarism. Vanessa Beeley & other libertarian supporters of Assad have been producing tons of this rubbish for a long while & he certainly borrowed most of his lies from Beeley in particular. She tends to work libertarian media like Global Research, Ron Paul’s media outlets, & others of her own invention like 21st Century Wire. As a more recognized writer, Blumenthal has access to less tainted alternative media, which is why he referred to Beeley & her co-thinkers as “marginal” rather than acknowledge his indebtedness to them. On The Real News, he faulted the White Helmets for not being neutral on Assad & insisted they wanted regime change in Syria. So do hundreds of thousands of other Syrians. How can our man Max expect rescue workers pulling people out of rubble whilst Russia & Syria are bombing cities to be neutral about Assad? Wouldn’t it be amoral if they didn’t have a strong position? He excoriated them for supporting a No Fly Zone (NFZ). White Helmets do support a NFZ in the hopes it will stop the bombing of cities & Syrians can come out of their underground bunkers to see the light of day again. There’s no need to beat around the bush: they’re wrong about a NFZ. A NFZ is an act of war, not a neutral action, & it is a political mistake for antiwar activists to concede to such a demand even if some Syrians call for it. The US Pentagon is the only military powerful enough to impose a NFZ to counter the combined military forces of Syria & Russia. But enforcing a NFZ would put US war planes in direct conflict with those two air forces & not diminish bombing but turn Syria into the Apocalypse. Proponents of a NFZ can be naive or misguided, some can even play stupid about it, but most of them are desperate for the bombing to end. Nevertheless, there is a history to the use of a NFZ, particularly in Iraq & Libya, which antiwar activists cannot in principle deny or play stupid about. The US has no right to intervene in Syria in any capacity & that must be the antiwar demand, along with demanding Assad stop the bombing & the withdrawal of all foreign air & ground forces. Advocating for a NFZ, however, is not sufficient to condemn the White Helmets when they have to deal daily with the carnage of Syrian & Russian bombers. Blumenthal also faults the White Helmets & other Syrian political groups for “cozy relationships with a public relations firm” that works the media to discredit the Assad regime & promote a NFZ. Cozy relations with a public relations firm are far less troubling than the cozy relationships that Vanessa Beeley, pro-Assad journalist Eva Bartlett, & a delegation from the US to Syria (who claimed they represented the US antiwar movement) have with the Assad regime. That US delegation is also now touring the country opposing US intervention policy & promoting Assad as a champion of the Syrian people. All of these people. including rightwing political figures, boast of their relationship to Assad, have photos of themselves meeting with him, have special visas for access to Syria denied many other journalists. There’s one part of Blumenthal’s articles on the White Helmets & of his interview on The Real News that really shows the stuff he’s made of: hack material. He tried to deconstruct the image of little Omran, just as Beeley & other Assadists who call it the “Omran Deception.” He described how the photo of Omran in the ambulance (after being rescued from a building bombed by Russian or Syrian war planes) was staged & said it was a shame the little boy was being used as propaganda fodder. Propaganda fodder against what? The Russian & Syrian airstrikes on civilians & cities? Doesn’t our man Max think that should be exposed? Doesn’t such carpet bombing speak strongly for regime change? Has our man Max gone over completely to the dark side & found his real place in life? 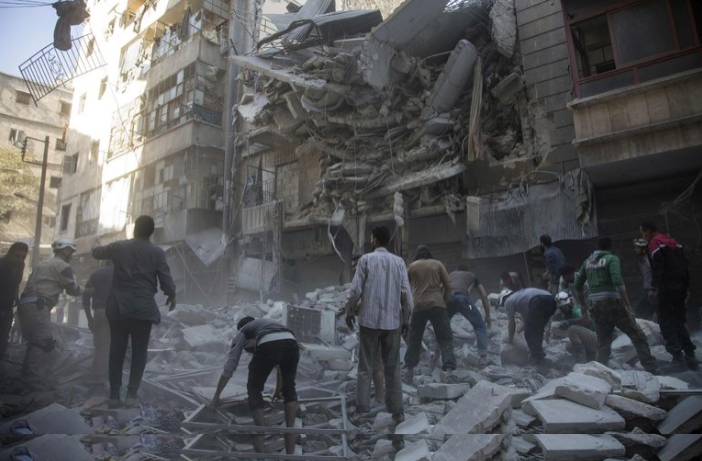 Photo is civilians & rescuers at the site of a Russian or Syrian airstrike on Aleppo, Syria, Sept. 27th. End the bombing by Syria, Russia, the US! No military intervention in Syria! Demand the immediate, unconditional withdrawal of all foreign air & ground forces.